You're jumping for joy. Your head is in the clouds. You've butterflies in your stomach. Fret not! 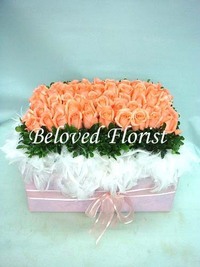 We've the perfect basket for you to exalt your love. Complete with 50 stems of pink roses that speak volumes of your intensifying affection, and adorned with the lushest feathers, it is set to tantalize all her senses!